The positions are for Nationals only with a probationary period of 6 months each. Another year, another, another August 12 and it is the International Day of the Youth (IDY)! UN Secretary-General as part of the protocols around the day, releases a message; this year the theme was “Youth and Civic Engagement. Emerging threats, violent extremism, shifting political conditions, economic turmoil and social transformations are combining to heighten the challenges facing the world’s young people. No one knows better than them the issues at stake or the best way to respond. That is why I am calling on young people to speak out – and I am urging leaders to listen. The story highlights the hypocrisy around the issues of “Youth Development” and “Youth Participation” across many levels of the socio-economic polity of the present world – at the workplace, at school, at church, at the mosque, at home and elsewhere that young people form part. Mr. Ki-Moon states further, “as the world changes with unprecedented speed, young people are proving to be invaluable partners who can advance meaningful solutions. Youth movements and student groups are challenging traditional power structures and advocating a new social contract between States and societies. Young leaders have contributed fresh ideas, taken proactive measures, and mobilized through social media as never before”. The statement continues “I applaud the millions of young people who are protesting for rights and participation, addressing staggering levels of youth unemployment, raising their voices against injustice, and advocating global action for people and the planet. In this landmark year, as leaders prepare to adopt a bold new vision for sustainable development, the engagement of youth is more valuable than ever. At this critical moment in history, I call on young people to demand and foster the dramatic progress so urgently needed in our world”. In the many times we (leaders and youth interest workers) have treated young people as people we have to speak on behalf for, that they can not speak better for themselves. But young people have been demanding for many years, young people have led and won protests. Across Africa, many countries can not boost of their independence without the efforts of young people. What is needed beyond the rhetoric is for Youth-Adults to be able to work together – not a relationship of unequalness.Youth-Adult relationship is not a one-way street. It is not one of youth speaking and adults listening or the other way round. It is a symbiotic relationship that must be built on trust, merit, honesty, transparency and on sound principles of creating a stock of replacement for the present and future generations. 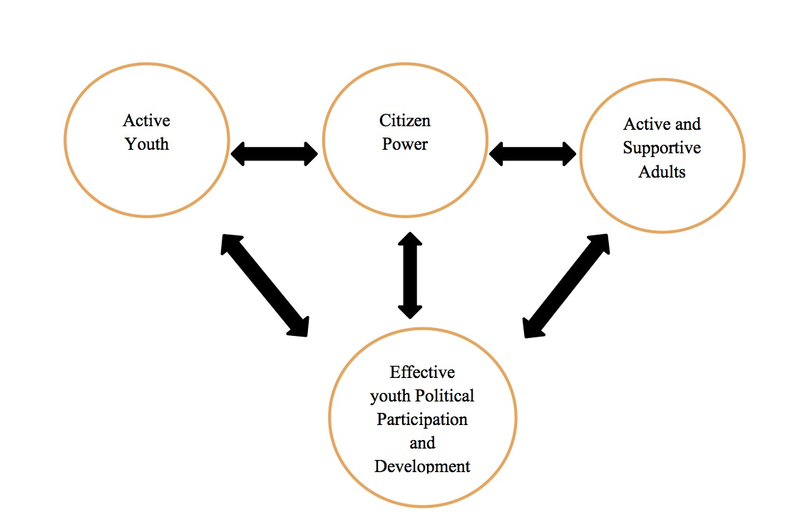 Many concepts and theories around youth development and youth participation denotes a one-dimensional approach, as Tsike-Sossah (2012) “…the one-dimensional characterisation of youth participation sees youth participation as a process youth themselves must influence so that there is or there seems to be little adult input. Indeed, poor participation is always the fault of adults against youth” and in other cases youth against themselves. A better way of at looking at youth participation in the context of local government as a symbiotic process between active youth (as against passive) and active and supportive adults. Arnstein (1969) proposes that the highest form of participation is “Citizen Power” made up of three types of levels of participation – partnership, delegated power, and citizen control. These three together will produce what Arnstein calls “full participation”. However, in order to produce or reach “full participation” one must recognise that this a product of a symbiotic relationship between active and supportive adults and active youth. Active youth are young people working to improve themselves to become politically active, by seeking the support of adults and or are willing to work with adults. If this relationship is nurtured it will lead to an “Effective youth Political Participation and Development”, which in itself will promote (an) “active youth” and “Active and Supportive Adults”. This framework will help for instance the National Youth Commissions to work effectively with its mandate of promoting youth development without alienating youth and other youth minorities, such as young women, in the process. Youth-Adult relationship is not a one-way street. It is not one of youth speaking and adults listening or the other way round.It is a symbiotic relationship that must be built on trust, merit, honesty, transparency and on sound principles of creating a stock of replacement for the present and future generations. If we must involve youth, we must act beyond talking down and handing over scraps from the “table” and get young people to the table through transparent and meritorious process rather than the current system of rewarding sycophancy. The youth participation rhetoric must stop and real action for and by young people should not need an encouragement – it MUST become the gold standard – the “youth-barometer” for development. The author: Tsike-Sossah is the Director of ACIPP West Africa and the lead consultant of ACIPP Consulting. Views expressed here are solely my personal views and do not reflect the views of my employers. Monday July 6th I flew from Schiphol Airport via Casablanca to Freetown. My first trip back to Sierra Leone since the Ebola Disease Virus broke in April 2014. I was in Sierra Leone and Liberia during the months of April and May when the cases begun to appear. I left because my wife and I were expecting a baby in June – we had a beautiful girl who turned 1year a few weeks earlier. During the rest of 2014, I have looked for ways to return to be part of the non-medical workforce in either Sierra Leone or Liberia but as fate would have it, I was not successful, not for the lack of trying but fate decided otherwise. You see, I am a strong believer in fate – I will explain: in 2009, I had a dream of plane crashes involving me and two other friends who were based in different parts of West Africa. I called them and they too had the same dreams during the week like me. We resolved to tackle the vision we had spiritually – we did what had to be done. I refused to fly the rest of the month and did some meditation. I am not party to what my friends did. During the Ebola crisis I dreamt on two occasions that I would not return if I went. So the one time I was close to clinching a job, I left the decision to “If I will go and return, then this job was going to be it”. I did not get the job and my sister and mother also had dreams and called to postpone travelling. For the first time in four years, I was apprehensive to travel. My spirit was disturbed. I was worried about many things travelling to Freetown after I am a believer in fate and destiny shaping my life. Others say its God, I just say it is “energy”. Well, lets not delve into metaphysics or religion. July 6th I was on Flight AT 853 operated by Royal Air Maroc. I arrived at Lungi Airport on the Morning of July 7th. It was humid and wet – the ground crew looked unhappy. After a short shuttle ride to the entrance to the airport, it begun! 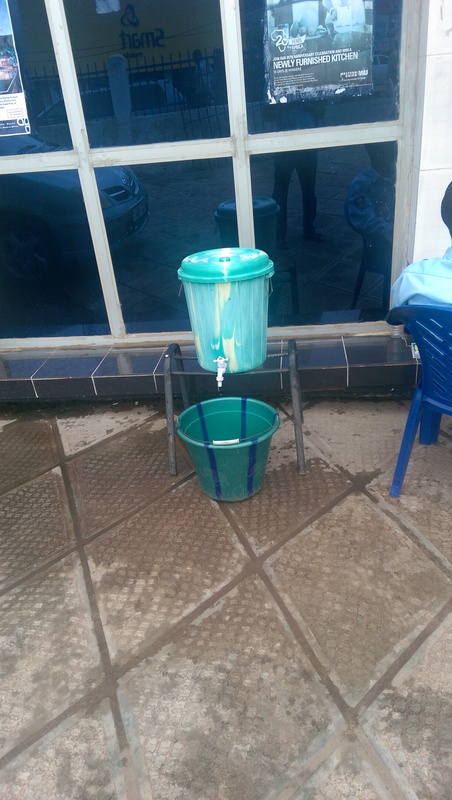 Buckets of water were placed at the entrance for us to disinfect before going through passport and security check. Some passengers tried to escape washing their hands but the guards refused to let those people pass. I have a staff of two in Freetown and in the nearly two weeks I have been here, we have not shake hands! I wish to have hugged them and say something nice to them having gone through a very traumatic time. While we have talked and keep joking about the “No touch” rule, I can feel the distance as the days went by; it is a jungle. Everyone just want to survive and anything will do. But what is important is that, we are HUMANS! We are programmed to touch – Sierra Leoneans like the rest of West Africa and people that love to shake hands! 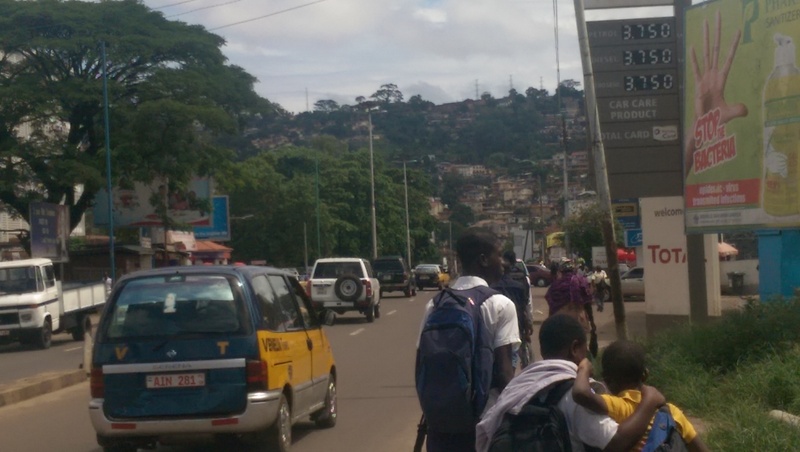 The streets are busy and bodies milling around and bumping into each other is normal but walking on the streets of Siaka Stevens Street, or the centre of the ; the pace is slower, there is less bumping and shoving. With the heat and sweat you do not want to touch. Ebola has redefined how we live. It is defining how we love, can love, show affection and communicate. A gentleman I had not seen in 2 years and when we met, he was excited and run towards me, hands extended to embrace but I had to coldly remind him we can not hug! I was sad all day! I could not forgive myself for hurting him – by refusing to hug him, I have suggested he could have Ebola. While we all know that is not the case, the thought lingers. Just the other day two young men, not older than twenty; they may have been relations or long lost friends. They see each other and one runs across the street to hug the other. The one being hugged stood limp, trying not to hug. I watched and felt the enthusiasm dissipate from the “huger”. It must be hard on both of them. But what do I know? And I can cite more than 20 instances where this had had to be repeated over and over again. Will people become desensitised and detached? But I was shocked by the school children – they were lost in their little world. It was end of the school day and they are prancing and playing along the street. Some walking in twos and threes with arms linked at the shoulders. I have seen others race and lift another off his feet and I wonder… is it their innocence or is it my paranoia? I am afraid to shake the hands of the little kids that come to my door and say hello. I could not shake my neighbours whom I have not seen in 12 months! If Ebola continues, we will lose our humanity here in Sierra Leone (maybe just me). We will become loveless, heartless, emotionless people. Drowning our emotions in bottles and bottles of alcohol as the sirens of the ambulances once again return to haunt us. Dear God, please take this cup away from us! Ebola virus has caused much damage to societies in Sierra Leone, Guinea and Liberia. Businesses, economy, education, etc. have suffered. The World Bank and other institutions are still working on a definite number, however it is estimated in October 2014 that the region of West Africa will experience an economic downside of US$25billion. In January 2015, that figure was reduced to a low of US$500million and a high of US$6.2billion. These figures the World Bank claim is for the whole West African region and not just the three affected countries. According to the WHO, current total Ebola infections stands at 26,628, resulting in 11,020 deaths. Figures 1 and 2 show cases/deaths recorded as at May 3 2015 and how they are distributed across the affected countries. Figure 2 below shows that Liberia topped with the highest deaths of 4,716 account for 42.79% of the total deaths with Sierra Leone following second with 3,903 accounting for 35.42% of the total death and Guinea with 21. 65%. Mali, Nigeria, Senegal, Spain, United Kingdom and the United States together account for 0.14% of the total Ebola deaths recorded. But the declaration for Liberia does not mean Ebola is over. Ebola can come back to Liberia from across the border with Sierra Leone or Guinea where there was at least 35 new cases in the last few weeks. I have written about what may have caused the crisis in Sierra Leone to drag. I also discussed the political issues that may have contributed to further worsening the crisis in that country. Indeed the problem created by the Ebola crisis is bigger than the deaths of 10,000 people. Ebola led to the disruption the vaccination programmes for Sierra Leone, Guinea and Liberia. Key timelines to vaccinate children were skipped. This has created huge immunity gaps and a large pool of children that would die from future preventable diseases. Dr. Walter Gwenigale, Liberia’s health minister says: “measles vaccination dropped by 45% in August-December 2014 compared to the same period in 2013”. There are similar stories in Sierra Leone and Guinea as well. Millions of school-going children across the three countries for months have been left idle. There are fears that many of these children may have become sexually active and without access to contraceptives, many fear not only a spike in teenage pregnancy but also HIV and other sexually transmitted diseases. I propose 5 – things that should be done to prevent the remission of the virus. Perform a holistic national needs assessment: So far, there is no comprehensive “needs list” for post Ebola work. Many governments, ministers and international organisations are throwing numbers around without any scientific backing. For instance, what is required for students to catch-up on lost time? How much would it cost? Fix education: Poor Human Resource capacity as a result of poor education has very much affected how the countries were able to manage the crisis. The crisis itself has severely affected education. It is important to not repeat the post-war mistakes where people were promoted en masse. Bureaucrats must find creative ways of solving the backlog of schoolwork and students in their final years should be expressly supported to write their Junior and Senior High School exams. Hopefully we do not have another “lost generation” if the estimated 300,000 children fail their exams due in April and June. Transparency in the Constitutional Review Process: Sierra Leone and Liberia were both in the process of reviewing their constitutions, the Ebola crisis allowed everyone to take their eyes of the ball for a while. This has raised pockets of issues in both countries. Indeed Sierra Leone has a case before its supreme court to determine the constitutionality of the removal of its Vice-President. The sanctity of the constitutional review process will add value to the economy that has already lost value due the Ebola crisis. A transparent constitutional review process will bring confidence in the country and thus shore up investment outlook. Do not borrow more Money: Already the World Bank Group (WBG) has released US$650million to support the three-affected countries. This will only further impoverish the people as these loans and grants come with stingy rules that does not allow the proper organic growth of nations. All of Africa is a testimony of how WBG and IMF policies have failed the region. Invest in Training, Capacity Building, and Development: The Sierra Leone and Liberia Civil Services are still yet to recover from the war. Governments’ planning and implementation has not factored the role, growth and development of the Civil Service. In Liberia, the government “imported” highly qualified Liberians living outside the country to come back and take leadership roles. These “imports” earn multiple times over what their local counterparts earn. It is rumoured directors and ministers in that group earn between US$15,000-20,000 per month. Local directors and middle level Civil Service staff have a base of US$156. According to the Government of Liberia’s Civil Service Restructure Strategy (CSRS) 2008-2011, “Salaries of civil servants have eroded dramatically since the 1970s. For example, a new college graduate employed in the Civil Service in 1977 earned a net monthly salary of US$416.66 inclusive of transportation and housing allowances and could save part of the salary. Today no civil servant receives a base salary higher than US$156.00 per month, and college graduates entering the Service today earn less than US$75 per month” (CSRS 2008-20011 p24) On January 28 2013, the AllAfrica.com website reported President Johnson-Sirleaf approving a US$25 wage increase across board in annual message to the joint session of House of Representatives and Senate. The story is not different in Sierra Leone where the most qualified and forward thinking Civil Servants have been lost to international organisations, Non-Governmental Organisations and the UN systems and agencies. Sierra Leone and Liberia must consciously develop a measureable, effective and efficient system of investing to improve the delivery and quality of its Civil Servants. Importing citizens and paying high wages often to people that have no connection to their government or country will fail as we have seen these people abandoned their offices during the peak of the crisis in Liberia. While the fight against Ebola is being won, the West African region including the affected countries cannot continue to do things as usual. Our governments must make conscious effort to fix their borrowing, spending and implementation habits. Sierra Leone and Liberia particularly must give thoughts to the points given above or the next epidemic will be worse. S. Eyram Tsike-Sossah holds an Msc Political Science from the University of Amsterdam and an MA in Development Studies from the University of Cape Coast in Ghana. He is the author of “Youth and Local Governance: Youth Participation in Local Governance: Bringing Youth to Decision Making in Sierra Leone“. Simon works for ACIPP West Africa as its Executive Director and also leads its Consulting work in Sierra Leone and Liberia. With increasing numbers of refugees overwhelming European borders, the EU decided to put in place a strategy to ensure that lives are saved, rates of return to countries of origin are increased and migrants and refugees stay close to home and avoid taking dangerous journeys. Key targets to be achieved in this strategy include working with partners to improve the legislative and institutional framework for migration, assistance in capacity building on border and migration management, encouragement for voluntary return and support for reintegration and stemming of irregular flows while offering legal migration channels. Key to the success of this strategy and realisation of the agenda is third countries – who will receive the financial, logistical and technical support to manage the refugee flows and implement the activities to realise the targets and objectives. A total EUR 1.88bn has been dedicated through the EU Trust Fund for Africa with EUR 750m already pegged to projects aimed at creating jobs, and resilience in the horn of Africa. Turkey’s Facility for Refugees has EUR 3 billion dedicated towards immediate and structural support to stem the flow of refugees for the FY 2016/2017. 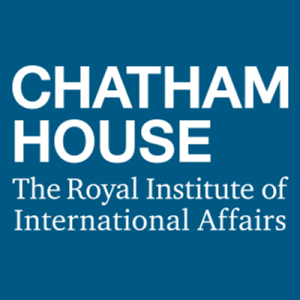 This PhD scholarship is open specifically to Zimbabweans interested in researching urban issues in Harare, to begin this autumn. The department of Geography, University of Sussex, has two fully funded PhD studentships to support the Migrants on the Margins research project. Migrants on the Margins is the Field Research Programme of the Royal Geographical Society with the Institute for British Geographers (RGS/IBG). Research aims to contribute to the urban governance of new migration into underserviced urban areas of selected cities, in contexts of environmental change and political uncertainty. The RGS/IBG Field Research Programme involves partnerships with other UK universities (SOAS and Durham) as well as research institutes in Colombo, Dhaka, Harare and Hargeisa. The two PhD candidates will focus their research on either the city of Colombo (Sri Lanka) or Harare (Zimbabwe). The scholarships, co-funded by the RGS/IBG and University of Sussex, cover all fees at non-EU student level and three years’ annual stipend at current Research Councils UK level (£14,296 for 2016/17). PhD scholarships advert – correct dates -edited. I had initially promised and drafted an opinion piece on the brouhaha over the Voters’ Register in Ghana but shelved it when I realized that other well-meaning citizens shared the same views. For me, there was no need belabouring the point if others were speaking from the same page. However, it seems the matter will not go away so I’ve summarized my take. At the heart of the debate is the absence of a comprehensive national database. It is a long term perspective that any serious person interested in our nation moving forward should not lose sight of. However, in the short term, a credible register is imperative. Does a new register guarantee that? Yes and no. Yes, if the processes for registering are foolproof. No, because the processes can always, have always and will always be circumvented by parties on both sides of the aisle. Seth Terkper, Ghana’s Finance and Economic Planning Minister will discuss decision-making in Ghana’s changing economic landscape and efforts to steer policy implementation towards recovery. Following the introduction of an IMF-supported programme aimed at supporting reforms towards faster growth and job creation while restricting fiscal spending, it is hoped that Ghana’s economy will stabilise and medium-term prospects will improve. Despite the setbacks of recent years, Ghana’s economy is projected to improve from 3.9 per cent GDP growth in 2015 to 5.9 per cent in 2016, according to the World Bank. Seth Terkper will discuss decision-making in Ghana’s changing economic landscape and efforts to steer policy implementation towards recovery.